The once highly endangered white rhino has clawed its way back from near extinction once before thanks to a dedicated team of conservationists. These conservationist's efforts resulted in one of Africa's most amazing conservation success stories. That success was evident in Africa's approximate 20,000 white rhino in 2007. However, in recent years the poaching threat has escalated to a current rate exceeding 1 rhino poached per day! In 2009 123 rhino, of both species, were poached, in 2010 that total rose to 333 animals, and in 2011 reached a staggering total of 448 animals poached in South Africa (this figure excludes those animals poached in other African countries). 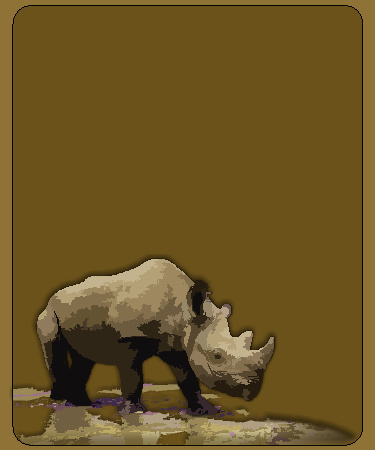 2012 statistics are, 612 rhino poached as of 10 December. Black rhino numbers are now estimated to be below 3,000 animals. Africa's rhino success is again under pressure and is now facing a threat that could take these animals back to the brink of extinction. 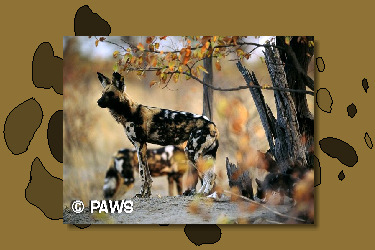 The African wild dog, otherwise known as the Cape Hunting Dog or painted dog (Latin name meaning “painted wolf“ refers to the unique, irregular mottled coat) typically roams the open plains or woodlands of sub Saharan Africa. These highly sociable animals live in packs of between 4 and 40 animals (larger packs were noted before the animals became endangered). These animals ensure that the pups are fed first, followed by the rest of the pack. As one of the most successful African predators, it is sad to see that man is the one who is determining their future. These animals require large territories, and due to human over population, these areas are shrinking at an alarming rate. Add to this the fact that these animals are often killed by livestock farmers, and that they are susceptible to diseases spread by domestic animals, the future of these animals is bleak. Unless we step in, they will, in a short time, appear on the extinction list. IT HAS COME TO OUR ATTENTION THAT OUR NAME (PAWS) AND LOGO ARE BEING USED IN THE CAPE TOWN AREA, AMONGST OTHERS, FOR THE PURPOSE OF RAISING FUNDS/OBTAINING DEBIT ORDERS FOR, AMONGST OTHERS, ANTI-CANNED HUNTING PROJECTS. 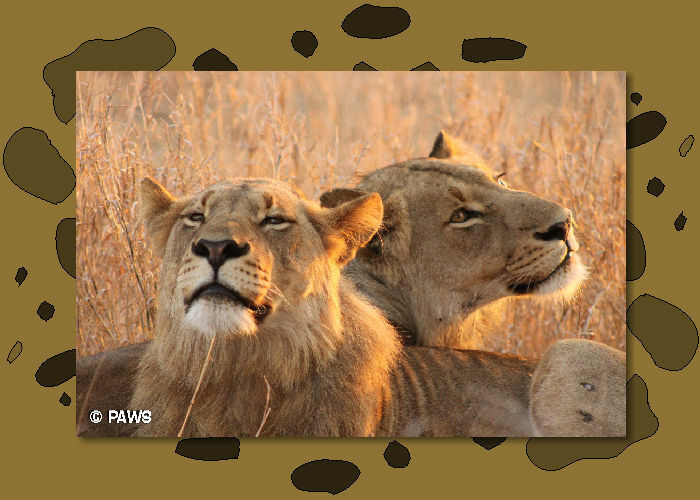 WE WOULD LIKE TO STATE THAT, WHILST WE SUPPORT GENUINE WILDLIFE FUNDRAISING PROJECTS, PAWS (Protect Africa's Wildlife) IS IN NO WAY AFFILIATED WITH, OR INVOLVED IN ANY COLLECTIONS OUTSIDE OF THE EAST LONDON (EASTERN CAPE) AREA. IF YOU ARE IN ANY DOUBT, PLEASE CONTACT GAVIN ON 076 801 6888, FOR CONFIRMATION. 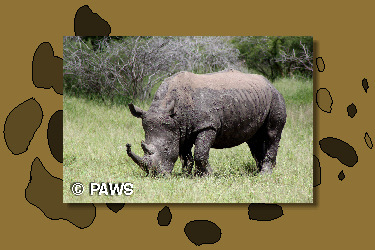 Rhino and elephant poaching has reached epidemic proportions in Afriac, and PAWS is here to try and help. 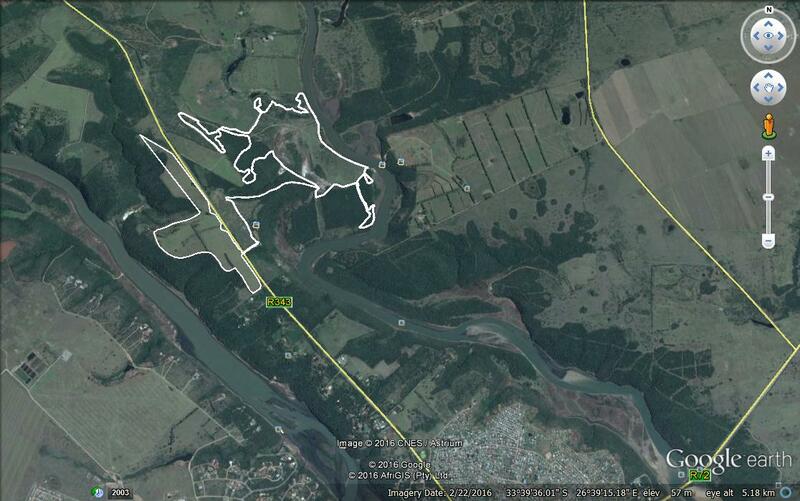 PAWS is a non-profit, non government assisted organization based in the Eastern Cape Province, South Africa. 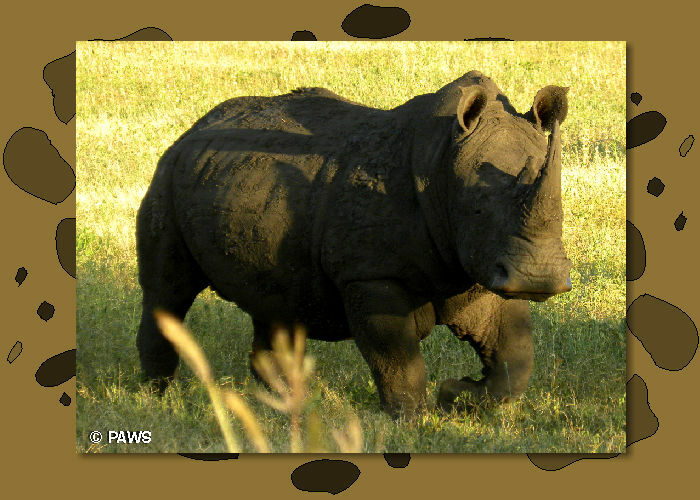 PAWS was formed in November 2011 in order to assist in the raising of funds towards the protection of Africa's wildlife. The main focus of the foundation has been, in recent months, the supply of both funding and equipment i.e. rhinomonitoring equipment as well as anti poaching equipment forvariousreserves in the Eastern Cape – South Africa . 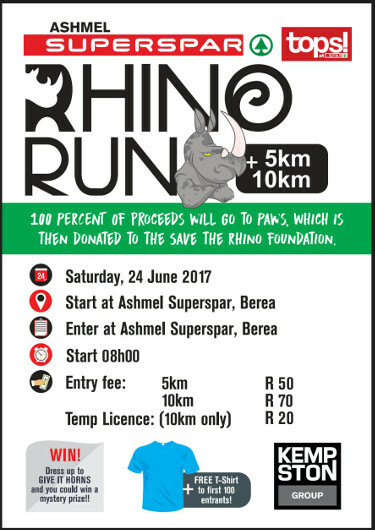 Funds raised ( > R130000 ) includes cash/equipmentdonations to Chipempere Rhino Foundation, Hoedspruit Endangered Species Centre, equipment donated to anti-poaching units at Shamwari, Amakhala, Kariega and Mpongo game reserves. We are currently raising funds for Kariega, for assisting in equipping and training their anti-poaching team, as well as for the Hoedspruit Endangered Species Centre. 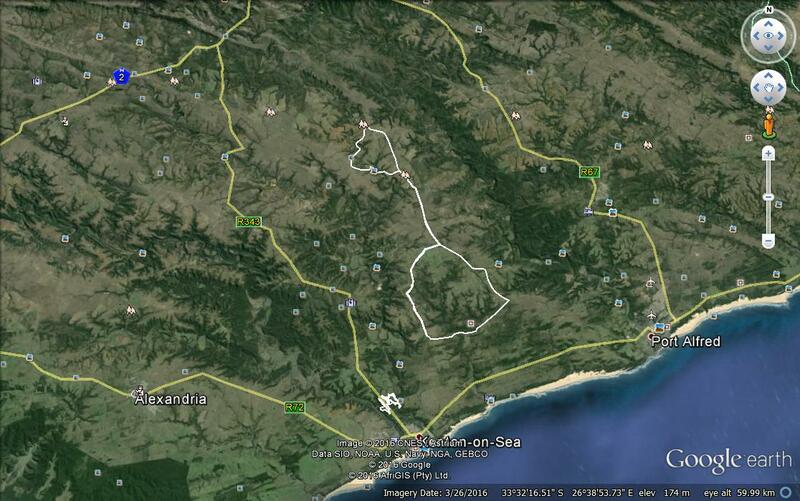 Our aim now is to continue supporting various anti poaching initiatives in the Eastern Cape. Poaching, not only that of rhino, has increased dramatically in recent years and we are committed to ensuring that this scourge is brought under control. We are also keenly aware that there is a desperate need for the creation of awareness in all age groups to the plight of Africa's wildlife. In addition to our commitment to antipoaching, we would like to emphasize to all the importance of the securing the future of Africa's wildlife, in particular those species identified by CITES as vulnerable, endangered and critical. i.e. 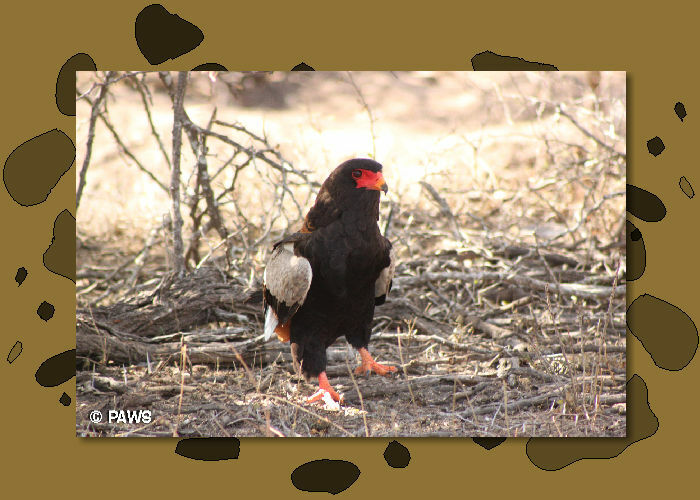 African Wild Dog, Cheetah, Rhino, Lion and many bird species. Without these creatures, Africa would certainly be a poorer place to exist. By raising awareness, and securing the future of Africa's wildlife, we firmly believe that we can make Africa a place where all would like to live and visit.